Have a great week and an even better Easter! Spring is coming! Slowly but surely! There will be an Easter egg hunt all Easter weekend. Find the eggs on this site get special discounts and prizes. Stay tuned. Been a while since I posted an article in the 'Reference' section, reserved for business related topics and motivational posts. This one definitely is worth sharing. I have slowly been getting used to my new environment, and work area. But a week off concentrating soley on moving and relocating, packing up my previous life and moving to a new one, really takes you away from where you were both physicaly and mentally. Its been a LONG time since I've gone 5 or more days without drawing a single thing, and it took its toll. When you dont practice every day, you break the habit. When you break the habit, some of your muscle memory goes away and its harder to get in that 'zone'. That being said a couple hours of solid drawing, inking, graphics work will fix this, and perhaps by the end of the week I'll be back to normal. But sometimes, you need some inspiration, that feeling of a sudden surge of 'yeah i wanna go do that'. All morning I was searching the word 'motivational' on youtube and other things. And yeah there was some killer ones about keep moving forward even if you get knocked down, or staying hungary, or excuses. Yada yada. But then I got some coffee (which always helps) and some breakfast, and then was watching a local news program I really like called 'Pittsburgh Today Live' - and they had a segment about a guy who followed his dreams and pursued juggling as a career. Inspiring stuff. It was just the segment I needed to see this morning. Inspiring guy for sure. Click the image or any of the links to go watch the video on the CBS Pittsburgh site! 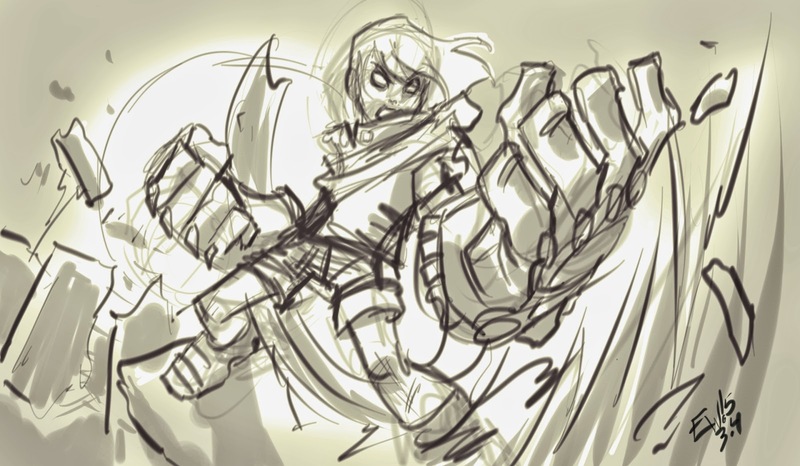 Just a quick warmup sketch, fast and loose to warm up the hand. 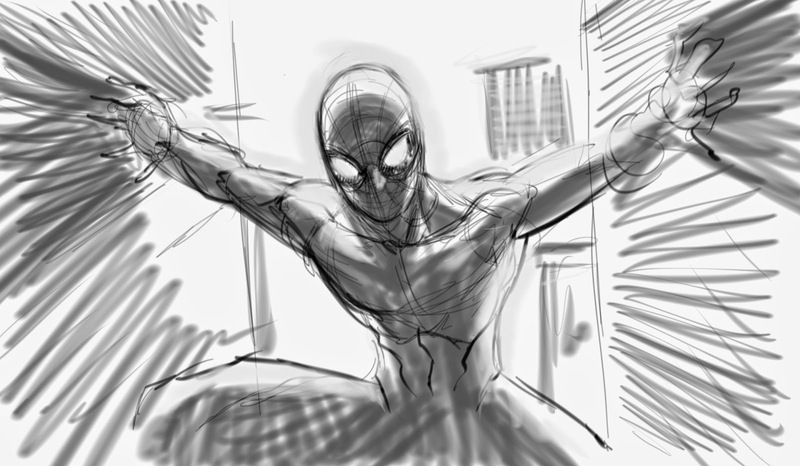 Some spidey straddling an alley spider style and the lightning from it. Eh, just a rough. Off to get some work done today! Still playing catchup, thank you for everyone's patience! Well, I'm officialy working out the kinks in the ol' drawing hand etc. 5 Days straight of not drawing a thing makes it hard to get back in the swing immediately but the best thing to do is open up Autodesk Sketchbook Pro and just strart drawing. And keep drawing till you get that warmed up flow back. Getting there, and this is the first official piece I've drawn etc at our new house, in my new studio :) Always fun drawing sci-fi space girls. Gettin there, be ready to tackle some commissions soon. Alright, well here it is. My new interim setup at our new house. This is dubbed by my wife as the 'sponge bob room' because it has sponge bob white, green and yellow walls and a sponge bob square pants cartoon border around the top. This will be redone later. For now, its my studio, with a guest bed behind the view of this photo. I have shelves to stow my supplies, samples of my work and reference material and got a couple framed pieces i will hang up later have them sitting around for now. The 'EWG orange' rope light is just for fun, especially when working in the evening and matches the orange desktop backgrounds of the monitors. 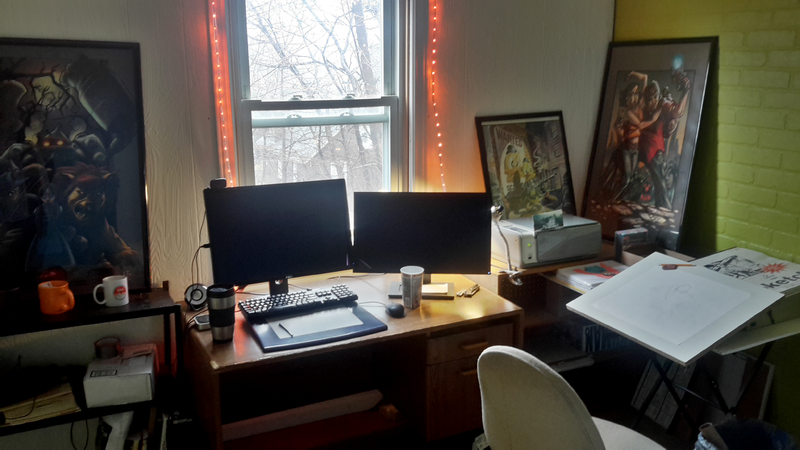 The left area is my computer/ wacom/ digital work desk area, and on the right is something I haven't had in a long time. A traditional work station. 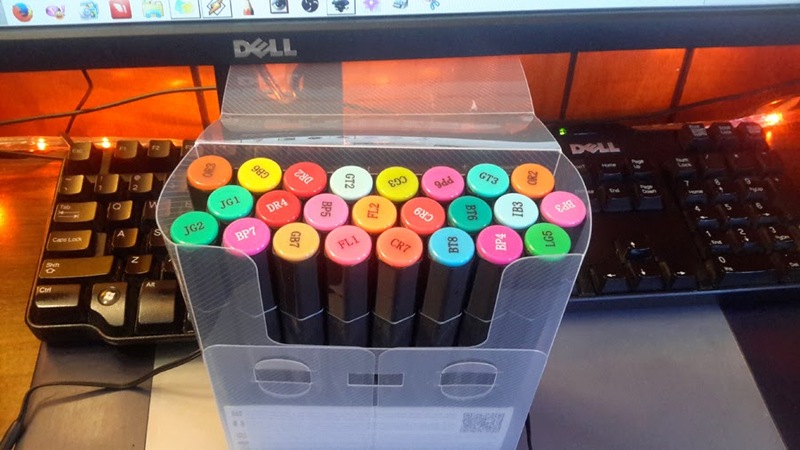 All my pens markers are in that box and infront beside the drawing board is packs of highly smooth card-stock and then yes, I have a drawing board again finally. On it I taped a sheet of newsprint and was warming up with some spiderman penciling with that visible pencil and eraser. The drawing board has grooves underneath that let it grip the edge of my makeshift 'table' and then its propped up on my light-box. So I can pickup the drawing board set it down to the side and pull up the light-box and use it. Pretty work area? Eh, to each their own. Spacious? Yes. Setup for maximum workflow? Yes. Very excited to have this new interim work space for sure. It is called interim because it is only till I get my true dedicated work space done on the 3rd floor. The whole 3rd floor/ attic space will be my reference lounge/ work area. But for now, its open frames up there and I get to start with as solid floor and a clean slate. This will be my work area till that is complete. Its technically the 4th floor and is 3 floors from street level. I playfully refer to it as the watch tower. It will house all my comics, reference books, figures and other geeky goodness as well as a small lounge area to sit and absorb inspiration and reference ideas as well as 2 to 3 long work table areas for traditional, digital and beyond. But for now, this is where I shall dwell and I think it'll work better than my last setup. The latest and greatest so far :) And with that, EWG is officially fully up and running and just reassessing where we were with orders and what to knock out before the weekend and into next week. Thanks for everyone's patience in me either getting back to them, or getting back to their orders. Some clients have complained, others have been amazingly understanding. And I understand both. But I'm back and will start hacking away once again. Priority will be on immediate deadlines and most character art will be subject to a 'order of received' waiting list while I tackle the weekly regulars. Got a break from work, but exhausted from the move. Work should be easy now. 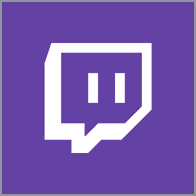 Also, our new home has faster internet so look for livestreams to return. Thanks and its good to be back! A 'leprechaun sized' Masked Planet for Gary - the 3rd and final person to find the Pot Of Gold in the 'EWG Pot Of Gold Hunt' held on St Pattys day. Completely drawn and inked in Inkscape and then colored in Photoshop! Fun stuff! Thanks to all the folks who hunted down the hidden pot on the EWG website! Was a lot of fun and I will have to make sure to do it again next year! That's it for these special chibi orders. 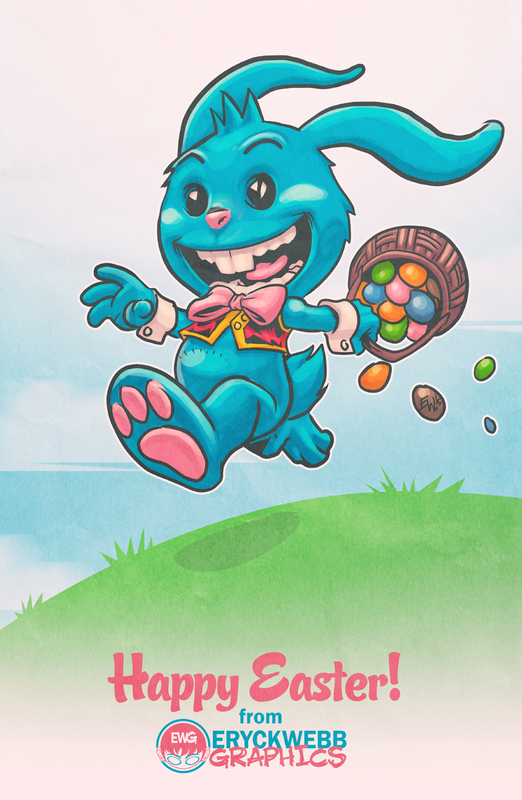 Stay tuned to EWG come Easter, will be doing a 'egg hunt' of some kind! Stay tuned! An off the cuff notebook entry: This is an EWG state-of-the-business update to all clients with orders in the queue and looking to order commissions in the near future. Well, the title and graphic say it all. The Webb's are moving into our house over the weekend! That being said, after this weekend, I will not have Internet for several days next week. I am officially on a 'working vacation' through next week. This means, 1.) I'm exhausted from cleaning, fixing and painting our house getting ready to move in and 2.) Getting setup for optimal workflow will take a while. However, internet or not, I will be taking an hour here and an hour there and work on things in between getting us setup in our house this week. I will probably do only one or two commission steps (inking this, coloring that etc) a day if that, depending on our unpacking/ setup. So Basically, for the past couple weeks we've been getting the house ready/ moving/ and heavy lifting stuff from storage to the truck then heavy lifting it to the basement of the house (thank god for an attached garage). Doing that till late at night most nights (I do admit I took a few off when able) then the each morning, after I finally get my achy worn self out of bed by late morning. But we got it to the point now where all we have to do is put furniture in it, wash dishes put them away. Before we were trying to get it all done before an appointment for carpet cleaners to come today. Thats done, so now we can pace ourselves, and at our leisure get a box bring it up, clean its contents and decorate with it. But will be spending the weekend getting the big furniture in, the beds the sofas the shelves, cabinets, desks etc. Honestly for the most part thats easy after all the spackling sanding painting and repainting that we've been doing. And lets not get me started on the tape we used to mask off areas, it was HORRIBLE coming off of the walls. And when you finaly find a technique for it it kills the ends of your fingers/ your finger nails. After today, Order Tracking will be neglected, emails / invoicing will not be done and there won't be much progress on most commissions but I will do what I can. Will just be one week at most. To get rested up, healed up (omg my hands/ arms/ legs/ back are so sore) and back in the groove. Hopefuly, in a more motivating and ideal work environment! Questions and Comments can be left below and thanks to all for understanding. 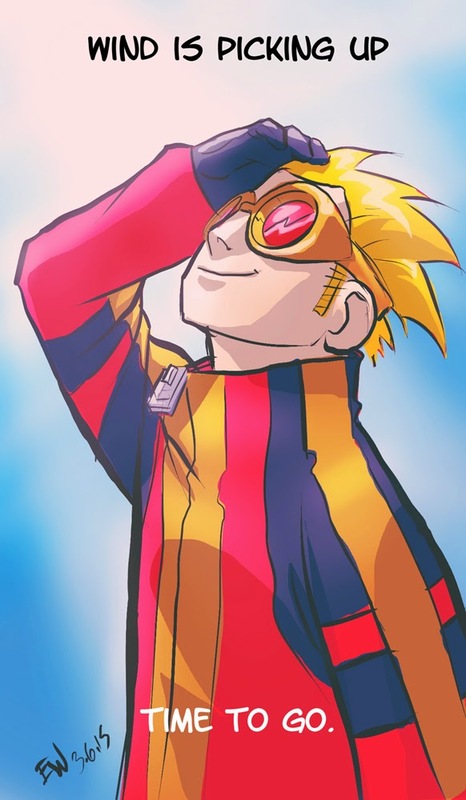 I can not update everyone individually by email that'd take a while but hopefully most of you follow me on Deviant Art ,Twitter or Facebook or (gasp) even on this site. And will be updated that way. Wish us luck! This new direction on our continuing journey of life is a overwhelming but exciting one! 5 Years ago I never would have believed this little commission business would be supporting a beautiful new home for the wife and I. Thank you to everyone who has and continues to support EWG. From both of us. A second chibi from the St Patricks Day 'Pot Of Gold Hunt', finished up for Jess! Worked on this thismorning while listening to Nightcore (aka uptempo techno that sounds like chibis are singing it) fun stuff. Tried some new things with the coloring. I like this rendered look. More 'mainstream' looking I guess. Anywho! 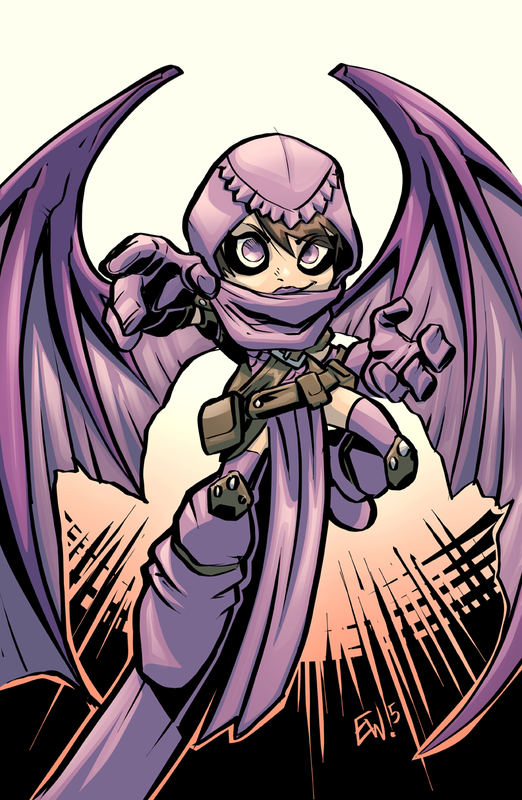 Enjoy your chibi, Jess! Be doing one more tomorrow. 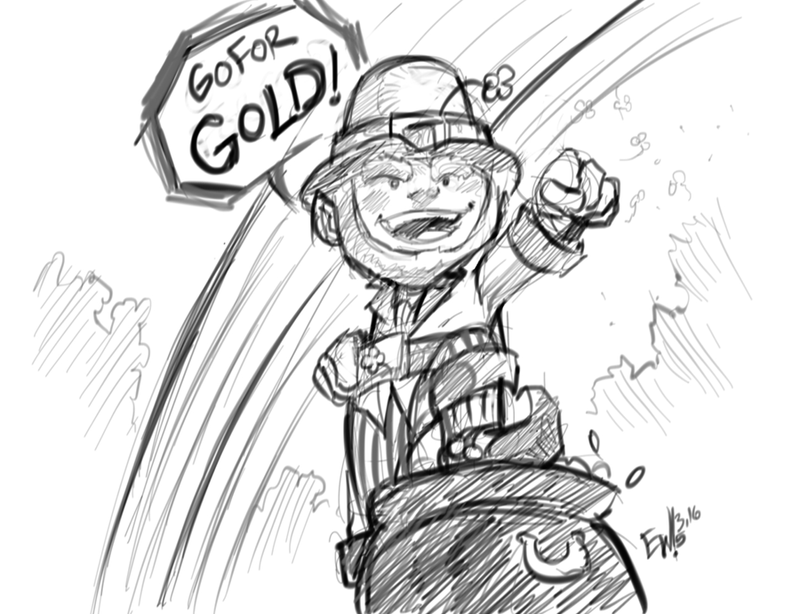 First chibi from the Saint Patrick's Day 'EWG Pot of Gold Hunt' event yesterday! Will do one each morning till the orders are complete. 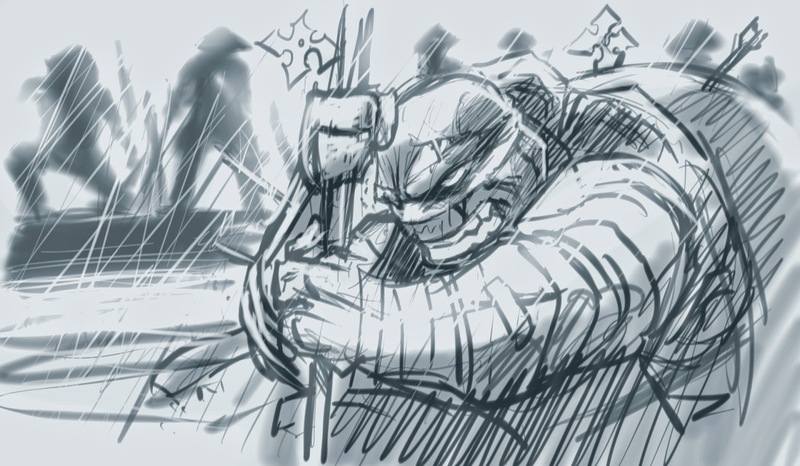 This one was particularly fun as I'm a TMNT first and fore most and Leo is my fav turtle. Mixed elements of me and Nick Nitro's UTMNT.com comic, the ol' 80s cartoon and even a bit of the modern cartoon into this. Fun stuff. Do another one tomorrow. Have a great Wednesday! Thanks to everyone who helped make the first EWG Pot Of Gold Hunt a success! A handful of lucky golddiggers found the pot of gold hidden on the site. The clue was 'take a Journey to the end of the rainbow' ... and the pot was hidden at the end of the EWG 5 Year Journey series of posts. To those who figured that out, you will be enjoying a 1/3rd cost chibi commission of your request in full inked and colored glory. This completes the hunt! Those who participated and didn't find the pot, and those who did especially please reply in the comments below of your experience and feedback on ways to improve it or what you liked about it for next year. Have a good one! And the second annual Easter Egg Hunt will be happening on Easter so get ready for that. Stay tuned to find out what the prize will be for that. The 1st Annual EWG Pot O' Gold Hunt is still under way till end of today! Find the Pot of Gold hidden somewhere on this site and get a $15 inked full color chibi of your choice. (Cause chibis are leprechaun-like) - have at it! Read this post for more information! 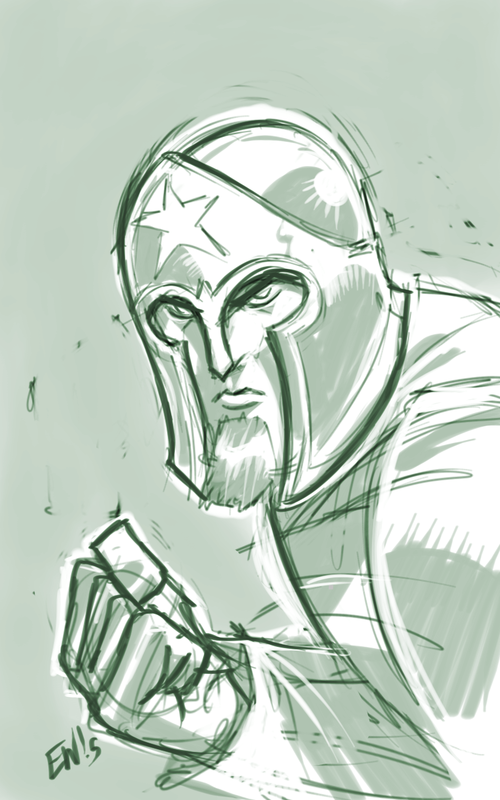 This morning's St Patty's inspired warmup sketch is in the vein of ol' masters like John Buscema and Jack Kirby and Joe Kubert with the loose sketchwork with heavy line strokes and light defining and textures. I turned the monitor/ tablet verticle to do this one as you can see on the second image. Fun working that way but sometimes not able to do it all the time. turns the monitor into a big verticle tablet to draw on though. now if i could draw directly on it that'd be the shiz. So.... might get a digitizer monitor in the future via the ol' business funds. For now though this wacom suits me just fine. Anywho, a big honkin tough man take on a leprechaun. Just try gettin his pot of gold, he dares ya! Pot Of Gold Hunt 2015 has begun! Welcome to the first annual Eryck Webb Graphics Pot of Gold Hunt! 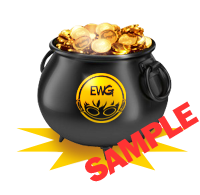 Find the Pot of Gold graphic like the sample one above, hidden somewhere on the EWG website, take a screenshot and email it to EryckWebb3 at yahoo dot com along with your request of what character you want depicted as a chibi. 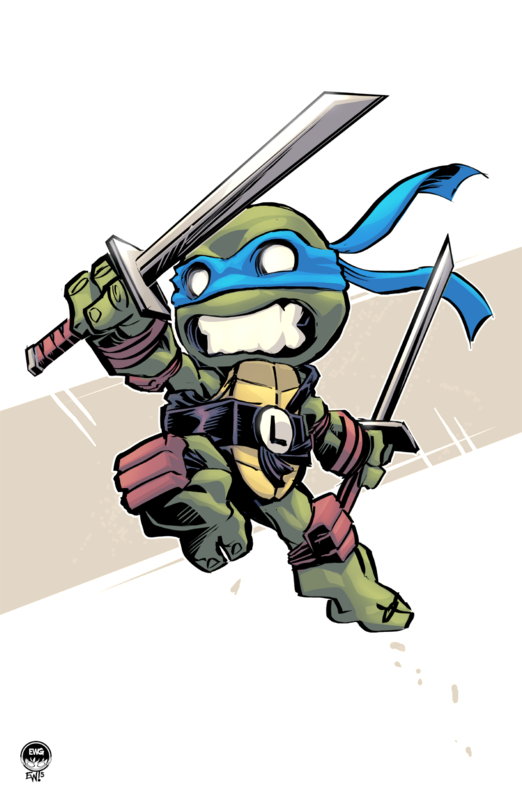 It can be a chibi of a popular character, a videogame, movie, animation, comic character, your own character or even a chibi caricature of somebody you know. If you were successful you will get a confirmation to invoice for $15.00 and you'll get the art in about 1 or 2 weeks! Limit one per customer for this event. As soon as this post is up (aka if you are reading this) the pot is hidden and the event has begun! That EWG Leprechaun bot has definitely hidden it well! The pot is said to only be visible during St Patties day and only can be found by taking a long, landmark filled journey to the end of the rainbow . But come Wednesday it will no longer be anywhere to be found! This hunt event goes from its launch 3/16 till the morning of 3/18. Happy Hunting ya buncha lucky charms! 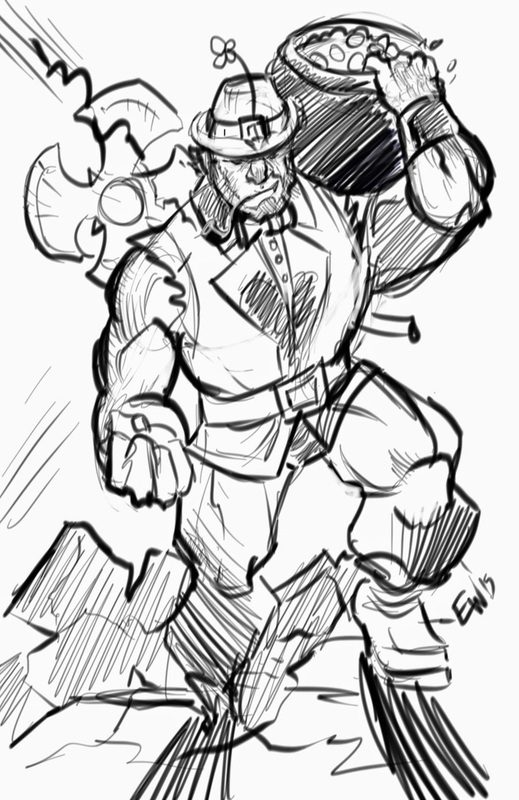 Yeah I'm drawin leprechauns a day early but hey, why not? Heres to Monday and the start of a new week! The weather's improving, and opportunities await, so what do you have to lose? Go for gold! Also tomorrow I will be hiding a pot of gold somewhere on the EWG site, whomever finds it, takes a screenshot and emails it to me will automatically receive a free black and white digital character art ink commission! Can be normal or chibi! Will be low key, will only post about it once on Twitter, Facebook and deviant art; mostly whomever actually follows/ reads this site regularly will know about it. The pot of gold will only be up from Midnight tonight till Wed. You heard it here first. Any feedback/ questions can be posted below! So, got these in the mail today. I got a couple traditional art commissions recently (I know, been years) and wanted to make sure to refresh and add to my cabinet of ammo to throw at them. Also, in coming months I plan on doing original art pieces for warmups and such and putting them in the EWGShop for sale. And these will certainly help with that. 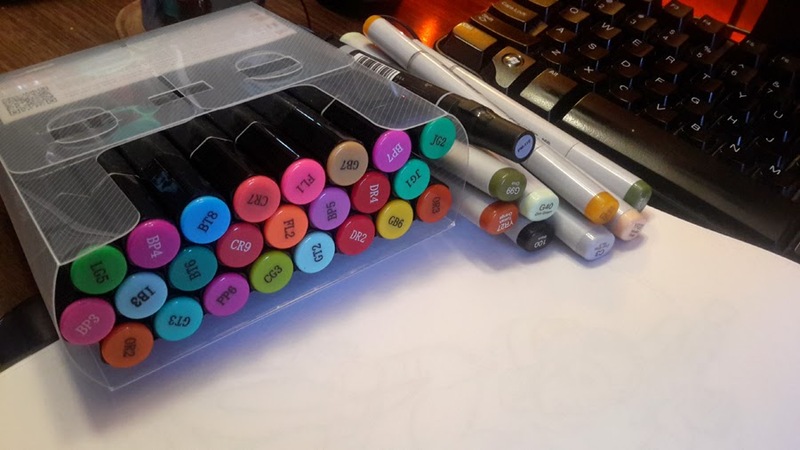 From playing with them for just a moment, these seeem to be jut as good as copics or prismacolors but way more economicly priced. And refillable. Possibly a great investment. Next up I'd like to get the darks and other shades they have. These are the 24 pack of brights. A fast transformers warm up before working on some pages this afternoon. A transformer completely made up from top of my head. Just used shapes and features I liked and didn't try for any kind of character specifically. Ends up a mix of maybe shattered glass starscream, some drift, some galvatron and something else. Fun stuff, alright off to knock out some pages. Thanks for checking out this latest edition to the sketchbook gallery on this site. 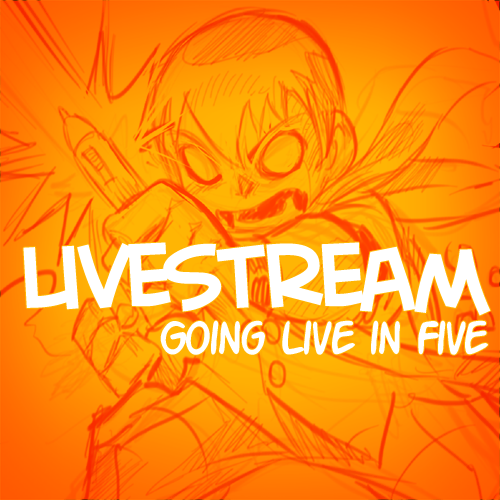 Going to be livestreaming inks and colors on two commissions this morning - come have a seat! Enjoy a glimpse at my work flow and the opportunity to talk to me in real time in the chat! KnightHunter - Kickstarter Campaign Underway Now! 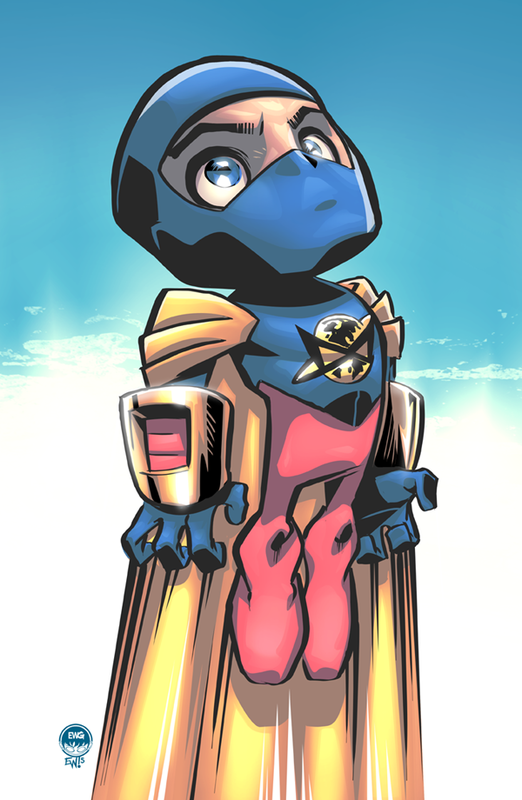 Since last spring I've been working on this comic job called 'KnightHunter' with writer/creator Dustin Smith. Its in my mind a very fresh spin on a classic tale. I think the potential is massive for this series, from its character designs, the relationships of the various characters as well as the powers and roles they play. The book is complete, its just looking for help getting printed/ and into the hands of readers. This is where Kickstarter comes in. Please take the time to go contribute some funds to this book being made. The art on this is some of the best I've done since Ungrounded and easily on par with any major publisher. The writing is fast paced and exciting and all the characters are unique with a lot of angles to them to be explored more in depth in future issues. But enough talk from me, go support the kickstarter, help make this book exist physically, and then you'll be able to check it out for yourself! "This is a story that needs to be told ... Trent Walker (KnightHunter) has overcome some insurmountable odds. ... Everyone has wished that at least once in life they could be something beyond themselves, well would you still want it, even if it killed you?" "Right now everything is ready to go, it just needs to be printed off by a printing company. The more copies I can print off the cheaper the per unit cost will be hence why I'm doing this kickstarter. " Warmup sketch this morning get out some of the kinks before working on commission orders today. An ol' character hope to get off the shelf some day, and have many diff ideas on how to do so. The alien with a knack for crackin robot skulls, Malcom. Coming to a webcomic near you far off in the future. Also want to use this post as an opportunity to remind clients/ fans that there will not be a Live Sketch Night this week, and most likely not next week either as just a lot on the ol' plate right now. Moving and pretty full with work, though with my current schedule I do have room at the end of March. Sound Off! What are your thoughts on this!? I took this screenshot off facebook today, I have a lot of mixed feelings when I see these ads on my feed. Most of those feelings are not on the positive side. But I am posting this screenshot and blog post as a call of action, sound off on your thoughts/ feelings on Fiverr and companies like them. How can they afford to do 5 dollar logos, how good are their logos anyways? Whats this doing to the development process of true designers? Comment below or on facebook/ twitter please! I want feedback people! A indulgent little warmup sketch this morning, of Jumping Boy looking beyond the clouds. Influenced by the blue skies and sunny lighting today, and the coming promise of spring-like weather in the next couple days. Melt all this snow let us get back to living outside again lol. Warm weather approaches. The wind is picking up, the weather soon shall be perfect for jumping, time for Jumping Boy to go! Have a great Friday and weekend. I doubt it'll be too relaxing for me, shopping for home improvement stuff tonight after work and then spending all day tomorrow workign on our new house getting it cleaned and painted so we can move in, hopefuly next weekend-ish. A pencil drawing I tossed some colors on this evening. All done on Samsung galaxy note 10.1 in sketchbook. 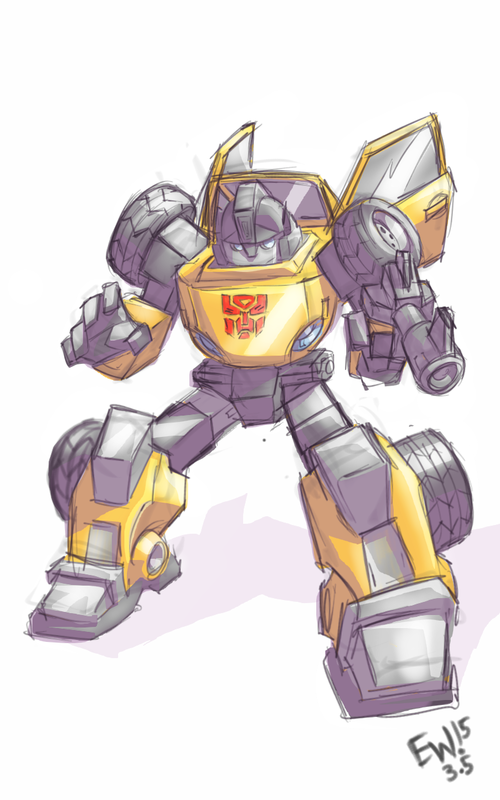 Just a fun random autobot. As if I didn't get enough transformers from that 4.5 hours of page pencils on my current shattered glass work today. Fun stuff. My own take on gully being that i did not use visual reference just sort of what i remembered - random warmuup sketch to get me drawing today. lots to do! time to get to it! 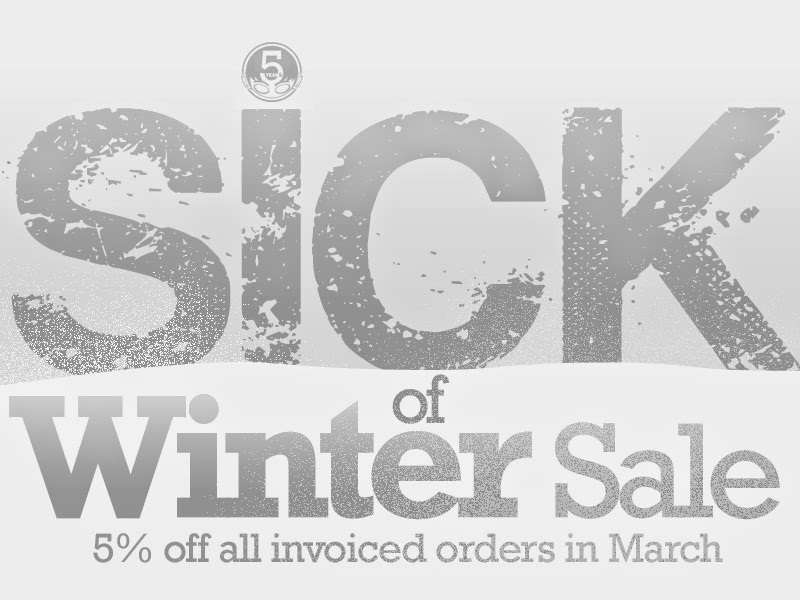 Introducing the all-March-long 'Sick Of Winter Sale' from EWG. Business proceeds as normal but any and all orders received during the month of March will be automatically discounted by 5%. The fun fact of this is the bigger the orders the bigger the discount. Accepting any orders big or small. Price-list is still under construction so please email eryckwebb3@yahoo.com for quotes and orders. Only applicable to those who wait for invoice before paying. Automatically waived if you do not wait for invoice. Any item from slot sketches to full blown comic pages and design. Ends March 31st! A sketch session before bed. Sat down, decided to slip into the zone a bit for some free drawing, and this came out. Definitely pulling from the City At War story from the original Mirage series where the hat-clad ninjas were owning splinter and the turtles, was 12 issues straight of just wall to wall slashing stabbing and survival between the turtles and the clans. This would make an awesome movie more geared towards adults. Something along the line of an epic ninja/ martial arts movie quit making it about hype and marketing and kiddieness. Have those personalities, but make an epic f'n ninja movie. NE who! An older, non-teenage donnie with the odds and health stacked against him. Boom. Gooodnight! Happy March everyone, heres to this bitter cold that is the winter heading out and the warmth and blooming coming in. Aw crap allergies follow. Ah well, WORTH IT. In other news, no Run Of The Mill this week, just too busy and also going to refrain from a Wednesday Night Livestream this week. 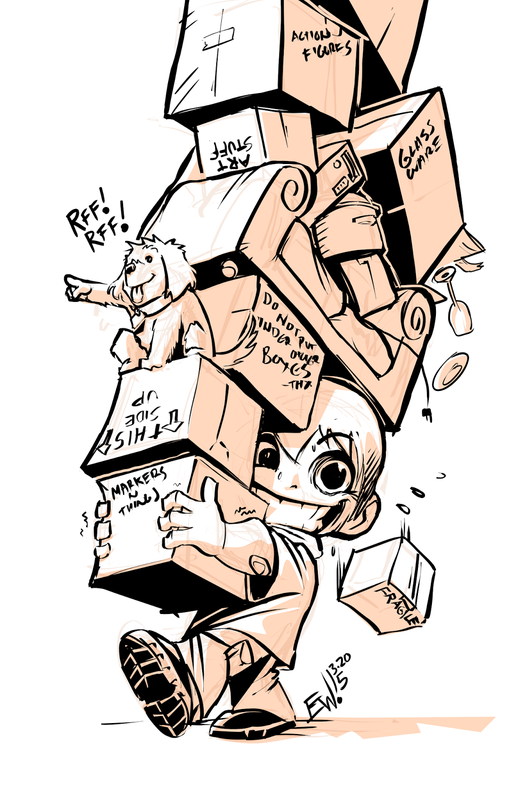 Tryin to lighten my load, have a better work/ life balance. See if that can't happen this week. Also, as a sort of 'hush hush' special all month long, celebrating this month, the birthday month of my wife Kristina, and also one of the most agonizing months waiting for winter to go away and for spring weather to get here, as well as losing an hour of our days again, I will be applying a 5% discount to all invoices this month. Also celebrates the 5 years in business, and hopefuly getting fully moved into our new house this month. Going to be a crazy month! So, in summary, lots of reasons to celebrate, thought I'd spice up the month with a 5% discount on all invoices no matter what it is. I invoice you, you get 5%. Goes for orders that I was supposed to invoice last week before March and didn't get to. ANYTHING invoiced in March. Folks who read my site posts will look forward to this, and folks who don't will be surprised haha. Enjoy! And heres to the month ahead! But its on my production map, officialy penciling pages 1 and 2 next week or as much as I can! Either way will be STARTING them! Lol.